Can You Spot The Gaming PC In This Picture? Hint: it's the one with the USB ports. I've just received a review unit of Maingear's miniscule Spark, a gaming PC that's larger than an ambitious sandwich. Introduced at the beginning of the year as a Steam Machine, tiny computers wait for no 2015 official release, so a version sporting Windows 8.1 is available for sale now, starting at $699. 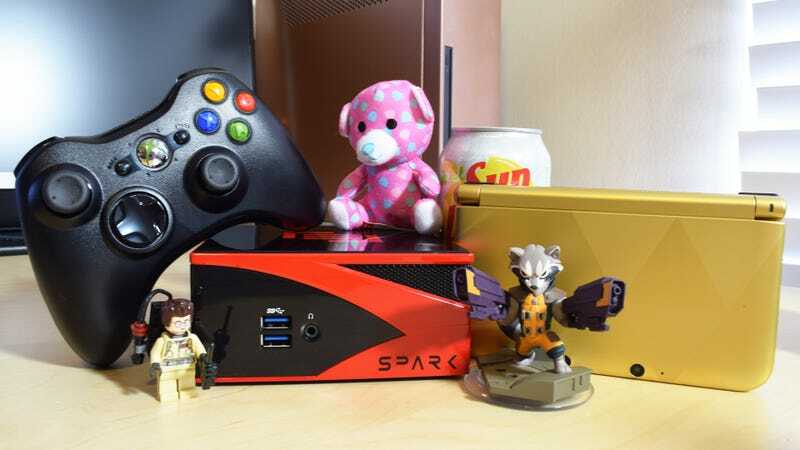 The Spark is essentially a Windows 8.1 laptop without the screen, running an AMD Radeon R9 M275X GPU paired with an AMD A8-5557M APU with a Radeon HD 8550G to handle day-to-day display tasks. Did I mention it's tiny? At 4.5 x 4.23 x 2.34 inches, the Spark is barely a thing. The unit is bundled with a VESA mounting plate, so you can attach it to the back of a monitor or television and never see it at all. I'll be spending the next week or two testing out the Spark and recovering from Friday's spine surgery. Oddly enough, my back problems first surfaced after I strained by back moving an 80 pound Maingear review desktop from my living room into my office. The doctors tell me I won't be able to lift more than 10 pounds for several weeks, so the Spark arrived just in time. Such a pretty little thing.